“We have all irrefutable evidence that this aggression, this attack on the Ukrainian navy’s warships, was not a mistake, not an accident, but a deliberate action,” said President Petro Poroshenko, who issued a decree on Monday imposing martial law for 30 days. 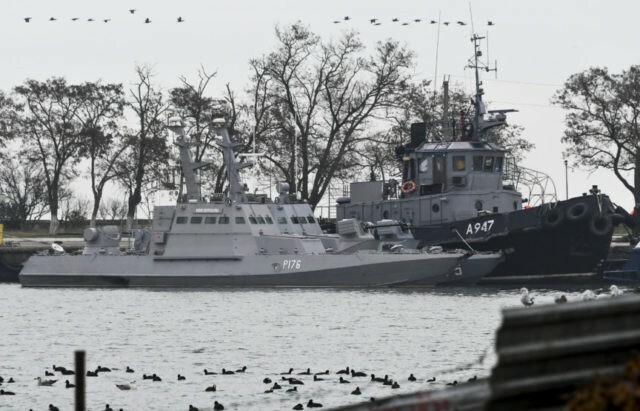 Russia claims the Ukrainian vessels provoked the attack by entering “prohibited” waters around the Crimean peninsula, which Russia annexed in 2014, and were fired upon only after they refused instructions to change course. Russia’s annexation of Crimea and its territorial waters is not recognized by either Ukraine or most of the international community. Russian Foreign Minister Sergey Lavrov on Monday accused Ukraine of deliberately provoking a confrontation to goad the United States and Europe into hitting Russia with more sanctions. “When the Ukrainian side was planning this provocation, they must have calculated the additional benefits they wanted to derive from this situation expecting the U.S. and Europe to blindly support the instigators, as usual,” said Lavrov. “The Group of Twenty in Buenos Aires is approaching. The Ukrainians also submitted a draft resolution on the militarization of the Sea of Azov at the UN General Assembly more than a week ago, and they must have thought it important to glean facts for this meaningless document which they spread in the UN,” Lavrov added, referring to a complaint Ukraine filed with the United Nations over Russia’s military buildup in the Sea of Azov and Black Sea, its interference with Ukrainian shipping, and its annexation of Crimea. Lavrov also denounced a demonstration at the Russian embassy in Kiev on Sunday night and accused the Ukrainian government of indulging hooliganism by allowing the protesters to burn tires and throw flares and eggs at Russian diplomatic facilities. “It is radical nationalists and neo-Nazis who run the show in Ukraine, and yesterday’s obnoxious flare-throwing activity in front of the Russian embassy in Kiev is another proof of that,” he said. “Russia rams a Ukrainian vessel peacefully travelling toward a Ukrainian port. Russia seizes ships and crew and then accuses Ukraine of provocation?” U.S. envoy to Ukraine Kurt Volker responded incredulously. The European Union called on Russia to ensure the vital Kerch Strait between the Sea of Azov and the Black Sea remains open. The EU stressed that it does not recognize Russia’s 2014 annexation of Crimea and therefore recognizes no Russian authority over the waters around Crimea. Russia blockaded the strait for several hours on Sunday but traffic has reportedly resumed. “I condemn the Russian use of force in the Azov Sea. Russian authorities must return Ukrainian sailors and vessels and refrain from further provocations. I discussed the situation with President Poroshenko and will meet his representatives later today. Europe will stay united in support of Ukraine,” EU President Donald Tusk said on Monday. Russia on Monday resisted nearly universal Western calls to return the three captured Ukrainian ships and 24 detained Ukrainian sailors. Ukrainian Foreign Minister Pavlo Klimkin stressed the captured crews should be considered prisoners of war under the Geneva Convention and stated his government is holding discussions with the Red Cross about their treatment.